13th of april, saturday, 11:00-12:00 - Website of commonroom! 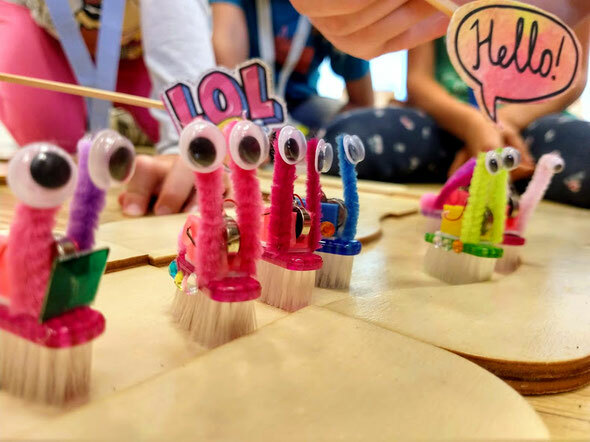 The adorable Wunderwuzzi robots offer children a fun introduction to the fascinating world of robotics. They can be assembled without additional tools with the 3D printed plug-in system placed on a toothbrush head. A vibrating motor starts the robot when a coin battery is inserted. The robots will be decorated individually with colorful materials. Additionally cardboard racing circuits and labyrinths will be build together. Building Wunderwuzzi robots is fun!